It’s Saturday morning and a perfect time to test a game for AmigaOS 4 while the rest of the family is relaxing upstairs. Hope you are having a fine Saturday as well. 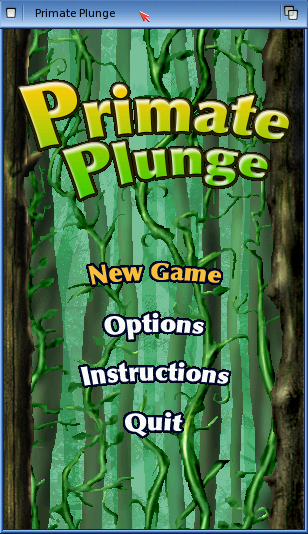 Today we’re going to look at a platform-game called Primate Plunge. It was developed by Joseph Humfrey and ported to AmigaOS 4 by Spot/Up Rough. It works on both AmigaOS 4 and AmigaOS 4.1. I got hold of the game by visiting Aminet.net, since OS4Depot was down for some strange reason. Click here to download it directly to your HD. Installation is very easy. Just unpack the archive (right-click on icon and choose “extract to” and select location) to your wanted location. Then all you have to do is to double-click the games icon to get started. As mentioned earlier, Primate Plunge is a platform game. More specifically, it’s a free-fall game in the style of Downfall by Remainder Software. This means that you are in control of a character on the screen that is constantly falling towards the ground. Along the way you must avoid obstacles by choosing the correct path. Bonuses can be picked up, such as extra energy. Now let’s have a look at how the game plays. The controls are pretty easy to get accustomed to. Left and right arrow keys to moves the primate in either direction, while arrow down drops your character downwards. If you manage to drop a certain distance, you will unlock new worlds. Power-ups can be activated by pushing the space bar. The first level is called Jungle Jitters. You must reach 100 points to advance. Your poor primate is met by thorny and sharp obstacles that will hurt him badly. Avoid these at all costs and get down there, that is the overall aim of the game. As you can see from the screenshot above, the graphics looks very good. Here I’ve just started falling! Watch those spikes above! I love such features in a game, since it makes you play it more – always nice to have a goal and it feels good when you’ve finally managed to open the last level. So all in all, I’d recommend you grab and install this one. Enjoy! Thanks for reading and see you in another post! Reblogged this on Old School Game Blog.